Smoky Mountain trip you will never forget! 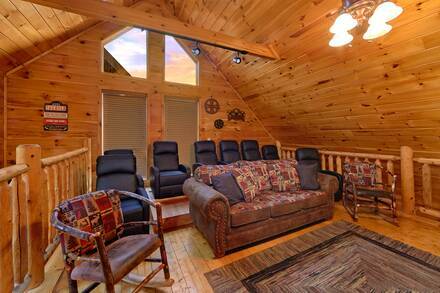 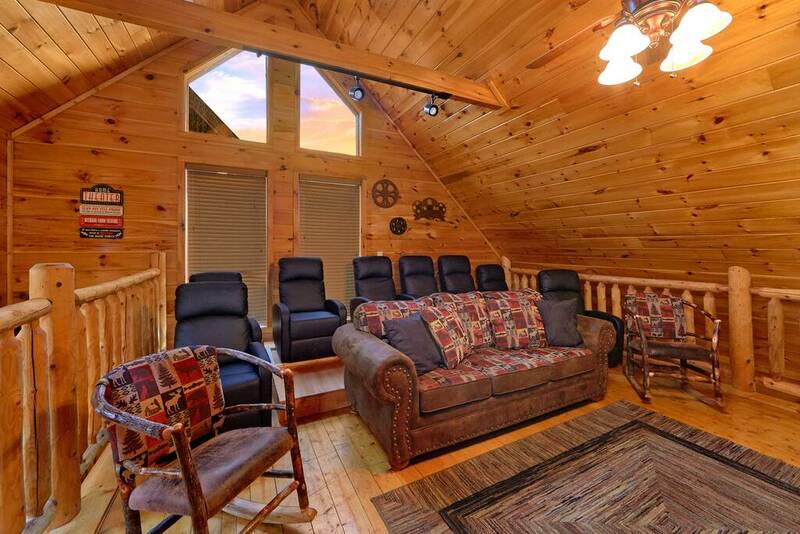 Most of our cabins in Pigeon Forge come with big-screen televisions, but Bear Crossing Lodge has an entire cinema room with a huge television mounted on the wall and theater-style seating. 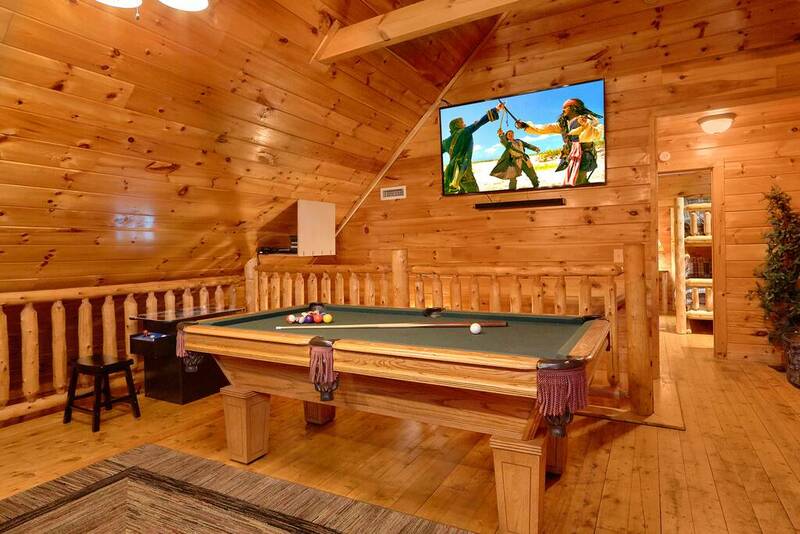 This large loft room also has a full-sized pool table and two-person arcade system for a great night out at the movies without having to change out of pajamas! 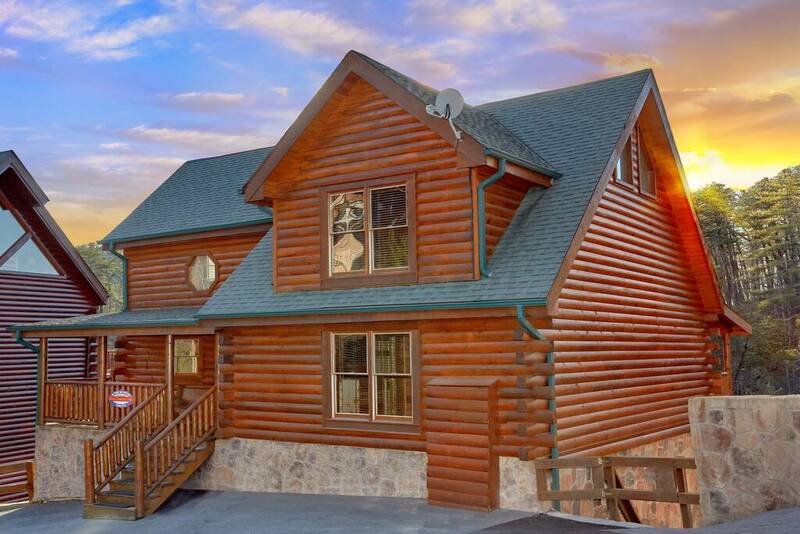 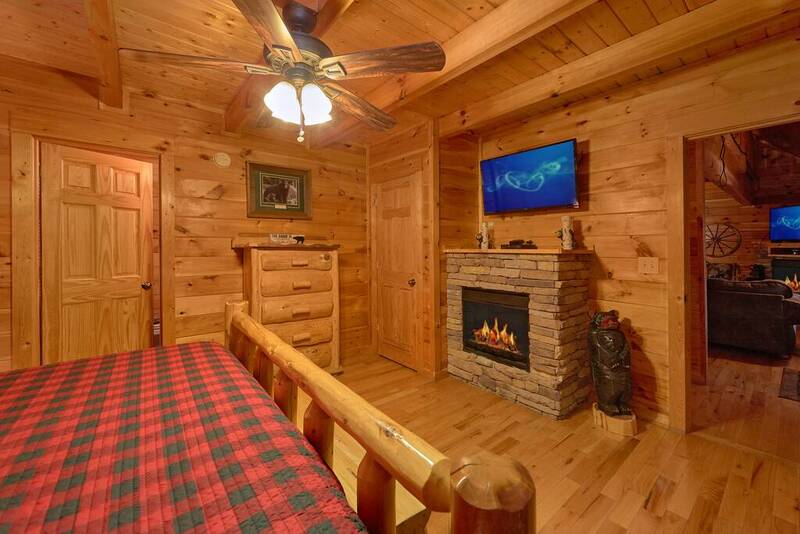 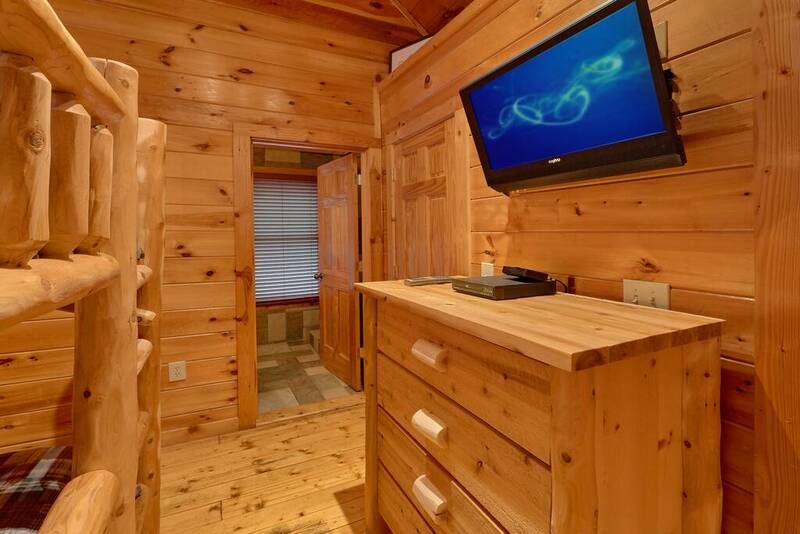 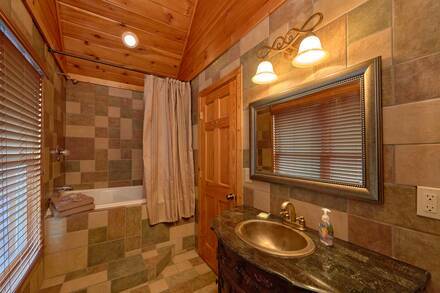 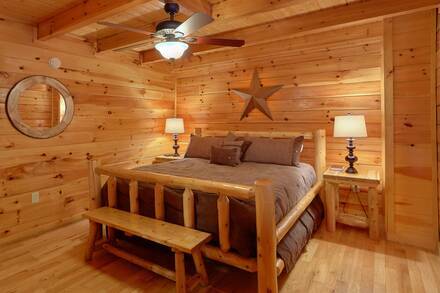 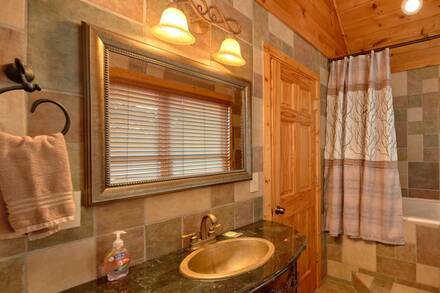 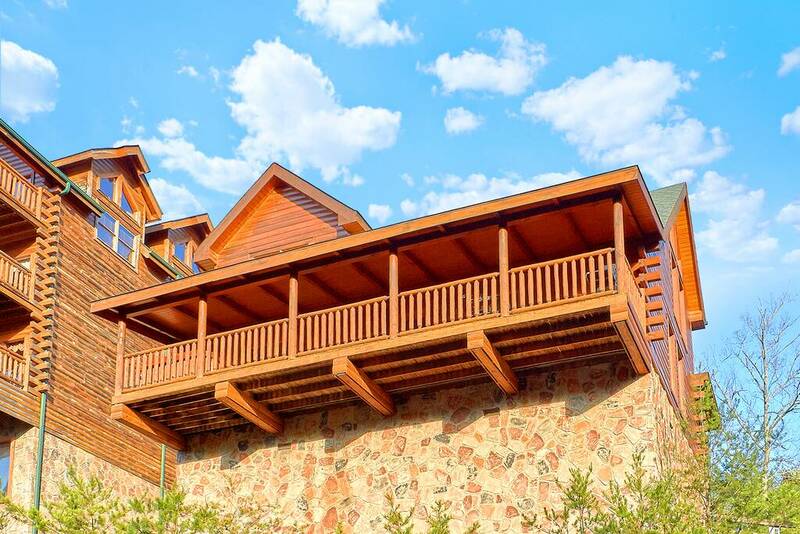 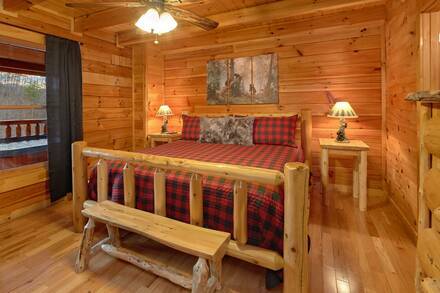 There are three fireplaces in this amazing cabin, including one in the master suite. 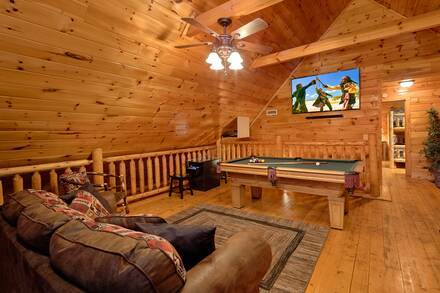 The cozy living room has another stacked-stone hearth, with comfy overstuffed cushions and rocking chairs nearby, plus another wide-screen television with over 260 channels. 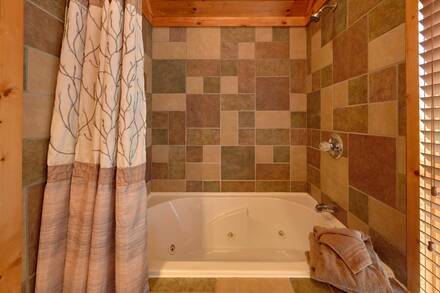 There are four bedrooms in total, with two master suites on the main floor. 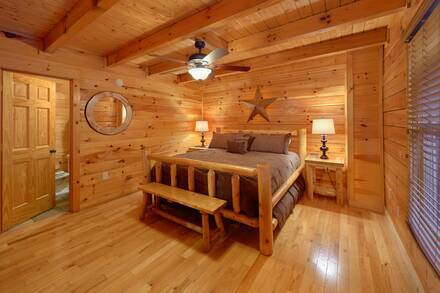 Each has a king bed and full bathroom. 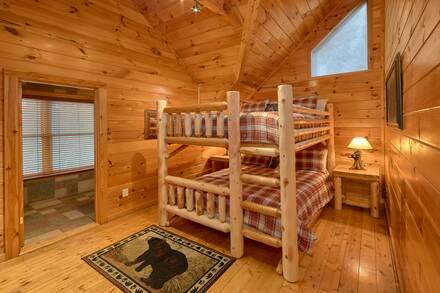 The upper floor has a pair of queen bunk beds and all have their own television. Two sleeper sofas mean bring the total sleeping berths up to 16 people. 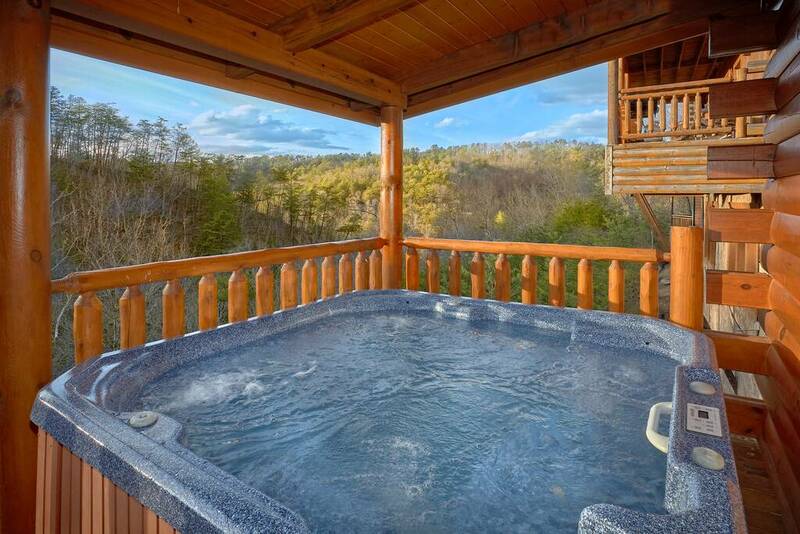 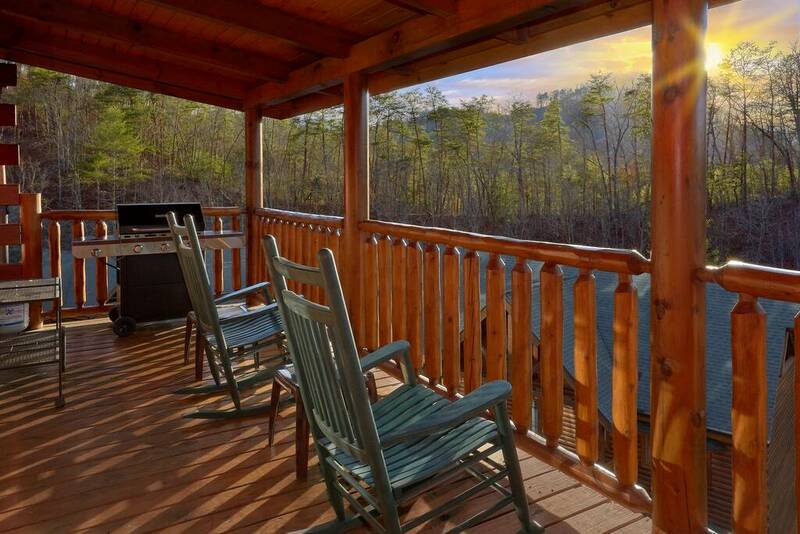 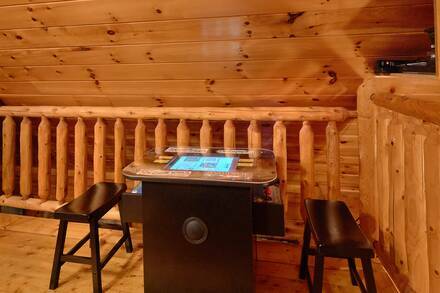 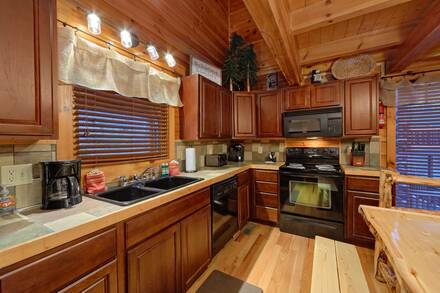 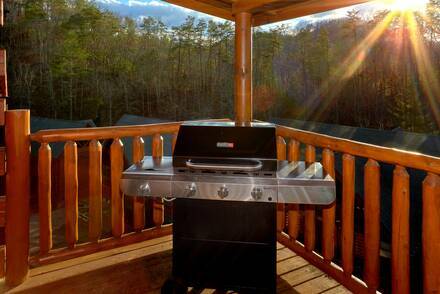 Outside, the large covered back porch has rocking chairs, and a hot tub with amazing views of the Smokies. Soak in the hot bubbles as you watch the sun set over the mountains, which are beautiful no matter the season. 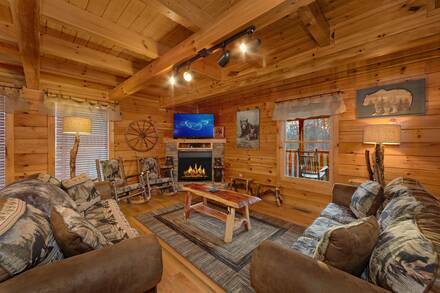 Another benefit to staying in this amazing lodge is access to all of the features of Black Bear Ridge Resort. 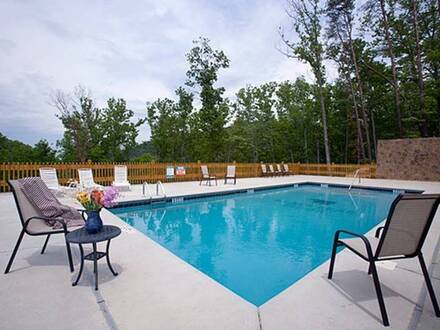 Between Memorial Day and Labor Day, enjoy the resort’s swimming pool and sun deck. 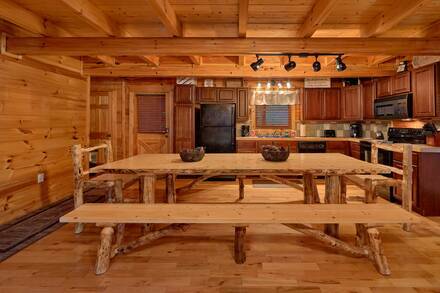 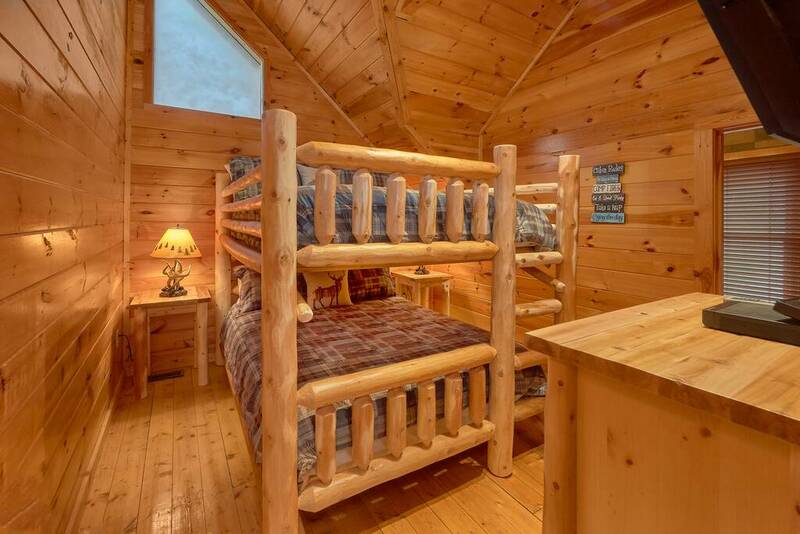 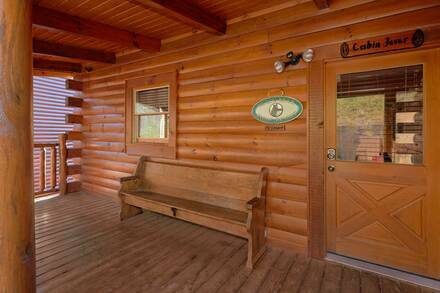 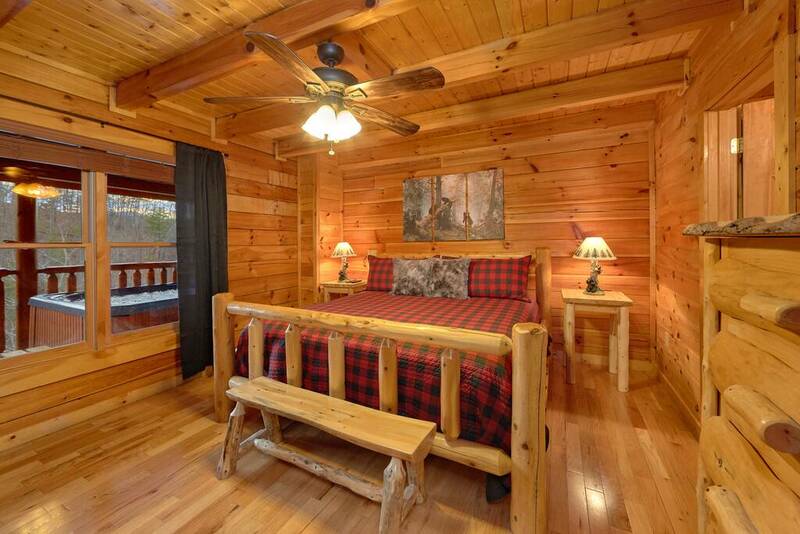 Bear Crossing Lodge is only a short drive from the Smoky Mountains, Pigeon Forge outlet malls, and the many amusement parks, so book now and secure one of the few large cabins in the Smokies that can sleep up to 16.